This article is about the TCG Booster Pack. For the OCG Booster Pack, see Duelist Pack: Legend Duelist 3. 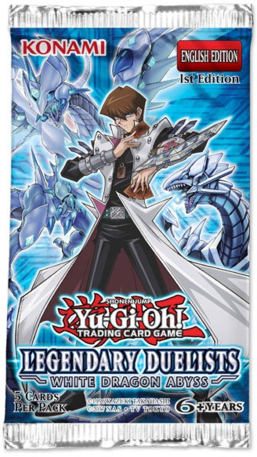 Legendary Duelists: White Dragon Abyss is a Booster Pack in the Yu-Gi-Oh! Trading Card Game (TCG). Includes cards used by Seto Kaiba, Zane Truesdale, Crow Hogan, Kite Tenjo, and Sylvio Sawatari. Includes members and/or support for the "Abyss Actor", "Abyss Script", "Blackwing", "Blue-Eyes", "Chaos", "Cyber", "Cyber Dragon", "Fusion", "Galaxy", and "Photon" archetypes, as well as the signature move and Signer Dragon series. This page was last edited on 1 March 2019, at 11:18.